Just like us humans, healthy plants require a readily available source of Magnesium. This metallic chemical element is essential for all life on earth and is absorbed by plants from the soil they grow in. Sometimes soil can become deficient in this key mineral making the use of fertiliser essential for healthy plant growth. 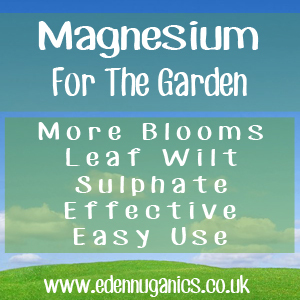 The most common form of Magnesium used in the garden is Magnesium sulphate, also known as Epsom salts. This naturally occurring mineral was first found in well water near the town of Epsom in England and has a vast array of health giving properties for humans and plants alike. How does Magnesium help plants? Plants convert sunlight into energy through a process known as photosynthesis. Without adequate Magnesium, the chlorophyll found in the leaves of plants cannot capture the solar energy needed to perform this task. Magnesium is also responsible for giving the leaves their green colour with plants deficient in Magnesium being identified by their yellowing leaves. This is because Magnesium is an essential component in the production of Chlorophyll. One of the best ways of increasing supply of Magnesium to your plant is by sprinkling Epsom salt around the base. Healthier foliage will be observed in a matter of weeks. Increase fertility of the soil in new garden beds with ¼ cup of Epsom salts per 25 square feet of garden bed area. The best thing to do is simply scatter the dry Sulphate granules over the soil and dig it into the top 6 to 8 inches of the bed. After completion, water well. When transplanting Roses it can be a good idea to add a tablespoon's worth of Magnesium Sulphate to the planting holes. This helps to avoid the shock associated with moving plants. Epsom salts can be diluted in water and used as a spray for tomato and pepper plants. The leaves of the plants absorb the Magnesium directly. Spray each plant until the leaves are thoroughly wet. Can I use too much Magnesium Sulphate? It is almost impossible to use too much Epsom Salt in your Garden. Magnesium Sulphate has a completely neutral pH balance, meaning it will not change the acid-alkaline balance of the soil. The crystals break down into water, Magnesium and Sulphur. All three of these components are beneficial in some way to most plants.